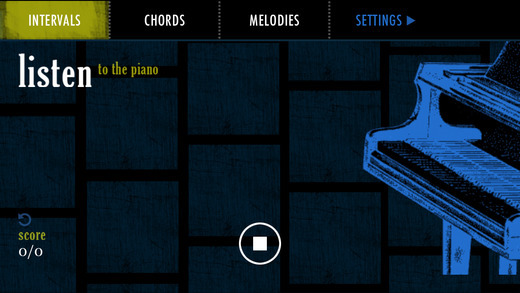 Play By Ear is a call-and-response ear training application that helps you develop the ability to hear pitches and play them back on your instrument by ear. Unlike other applications which force you to press buttons to indicate the notes you've heard, Play By Ear uses pitch recognition so you can play the notes back on your instrument (piano, guitar, trumpet, etc). Using your instrument to play the notes allows you to practice ear training in a method that most closely matches how you'll actually play music.----------------------APPLICATION FEATURES:----------------------- Pitch recognition so you can use your instrument to interact with the ear trainer- Hands-free, continuous play- Interval exercises- Chord exercises- Random melody exercises- Scale pattern melody exercises- Jazz lick melody exercises- Melodic and harmonic note sequences- Ascending and descending note sequences- Microphone calibration- Customizable tempo- Ability to show or hide the first note- C, Bb, Eb, F, G, and D key centers to match your instrument----------------------Note: Your device needs a microphone to fully enjoy Play By Ear's pitch recognition features. iPads, iPhones, and the latest iTouch all have microphones built-in, however older iTouch devices will need a headset or similar external microphone.